Reading and share top 9 famous quotes and sayings about Wine And Cheese by famous authors and people. 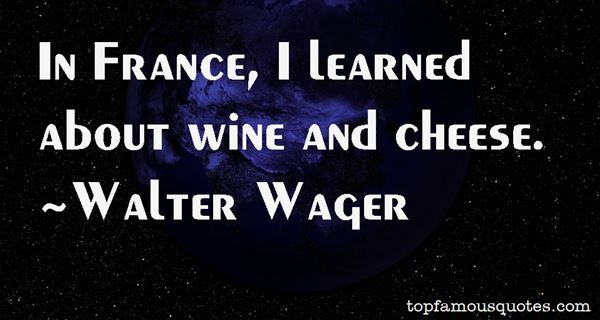 Browse top 9 famous quotes and sayings about Wine And Cheese by most favorite authors. 1. "Love and lust are as different from each other as red wine and blue cheese, but because they can also complement one another splendidly, they get conflated with amazing, dumbfounding regularity." 2. "I enjoyed retirement the right way... linguine con vongole, red wine and plenty of truffle cheese." 3. "Wine and cheese are ageless companions, like aspirin and aches, or June and moon, or good people and noble ventures." 4. "After the cafes of Paris with their exquisite wines and creamy fromages, crepes and steak tartare-- screaming Adore me!-- Madrid was these store-bought hunks of unyielding cheese and brick-hard baguettes, consumed in leafless Buen Retiro Park.ll Madrid, dressed as it was, tasting as it did, prideful as hell, didn't care what you thought about it on your junior-year backpacking trip. That was your problem." 5. "I eat excellent bread, clean meat, good crisp veggies, organic fruits and nice wine and cheese. It is one of the things I am truly grateful for. I'm not kidding. You can't ask a single mother of three working two jobs for minimum wage to eat that way. I am lucky." 6. 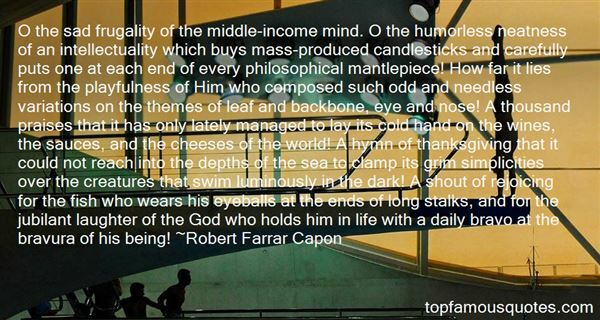 "O the sad frugality of the middle-income mind. O the humorless neatness of an intellectuality which buys mass-produced candlesticks and carefully puts one at each end of every philosophical mantlepiece! How far it lies from the playfulness of Him who composed such odd and needless variations on the themes of leaf and backbone, eye and nose! A thousand praises that it has only lately managed to lay its cold hand on the wines, the sauces, and the cheeses of the world! A hymn of thanksgiving that it could not reach into the depths of the sea to clamp its grim simplicities over the creatures that swim luminously in the dark! A shout of rejoicing for the fish who wears his eyeballs at the ends of long stalks, and for the jubilant laughter of the God who holds him in life with a daily bravo at the bravura of his being!" 7. "My wife and I love to host wine and cheese parties. They are simple and elegant and you don't have to put a lot of effort and time into it." 8. "In France, I learned about wine and cheese." 9. "You needn't worry. I don't think you have aged enough for me to partake of you. Blood, women, wine, and cheese all get better with the passage of time. You are not quite ripe. --Lane DeLuca"
My dearest Lucy," he said, his gaze never wavering from hers, "I would die for you."